Respiratory Protective Equipment regulations require that respirator users be fit tested initially and annually thereafter for every type of respirator worn to determine if the respirator properly fits the user. 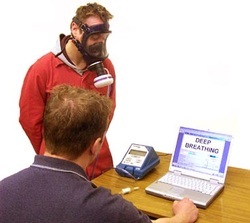 Enviro Safetech will quantitatively fit test your employees using state of the art quantitative fit test equipment. The fit test will involve normal breathing, heavy breathing, bend and touch toes, reading the rainbow passage, side to side as well as up and down movement of the head. A hard copy of the fit test form will also be kept by Enviro Safetech. The fit test information will also be registered in our computer database. This allows you complete and immediate access to fit test records of your personnel fit tested by Enviro Safetech.